Critical-Hits' Sentinel Comics will bring the heroism and simplicity of the Sentinels of the Multiverse card game to RPGs. If you're a fan of superheroes and gaming of all stripes, Sentinels of the Multiverse should be right up your alley. Starting out as a 2011 cooperative card game before branching into other mediums, Sentinels challenged players to team-up and defeat a maniacal supervillain in the span of an hour. Its easy-to-grasp power system and speed of play made it an Escapist favorite for years - and now developer Greater Than Games is expanding into tabletop roleplaying with a Sentinel Comics RPG. The news was originally slipped into a Gen Con activity schedule with little fanfare, but Greater Than Games has since unveiled more details. 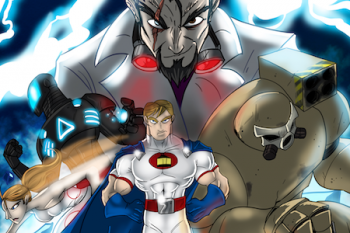 The Sentinel Comics RPG is designed by Critical-Hits Studios, and emphasizes all the action and simplicity of the card game. Critical-Hits will roll out a new system specifically for Sentinel's characters and setting, where players combine dice pools with powers and abilities. Characters from previous Sentinels games will be included, or anyone can try their luck with a custom-designed character. Fans of the original Sentinels game have good reason to be excited, although Critical-Hits has its work cut out for it. Superhero games are one of the most common genres in roleplaying, and Sentinel needs some special features to stand out from the crowd. That said, being able to branch out with all-new Sentinels scenarios is incredibly appealing - especially if the mechanics bring first-time players into the fold. Greater Than Games will run Sentinel Comics demos at this year's Gen Con, followed by a full release in early 2016.
this game was not simple. The core rules were simple, but then you actually play the thing and the cards themselves add hundreds of rules. I don't know if my friends and i ever played a game where we didn't forget some game changing card that had been played that would've either helped or hurt us drastically. I'm cautiously excited for this, SotM is a fun game to break out when you have a nerdier and less intelligent or detail focused crowd and it's co-op focus is nice for a "united we stand, together we fall" mentality. I'm worried that it's going to get sucked into a GURPs hole and just be another generic role playing system for their universe when you may as well just play the card game itself. Still, won't knock it till I try it. You and your friends sound dumb.